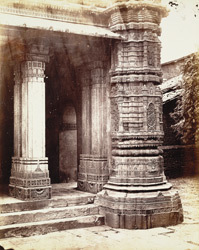 Photograph of Rani Sipri's Mosque, at Ahmadabad in Gujarat, taken by Henry Cousens in the 1880s, from the Archaeological Survey of India. This mosque, known as Masjid-i-Nagira or Jewel of a Mosque, was built in 1514. This image shows details of the carved stonework on the base of the north minaret. James Burgess quotes Fergusson in the Archaeological Survey of India, Vol VII, "'Notwithstanding the smallness of its dimensions...it may be considered the gem of Ahmadabad, and in its class, as one of the most exquisite buildings in the world.'"